Control systems aren’t designed to become antiques. Like any technology, they eventually become obsolete and need to be upgraded. But, when is the best time to make the investment? If the system is currently running just fine, a control upgrade might not be on your radar. But waiting until it fails might not be the best choice. For over 13 years, 2R Automation has been upgrading control systems for plastics machinery. We specialize in plastic injection molding machines, structural foam machines, and paint systems of all sizes and brands. Why upgrade? This is a common question our customers face as equipment ages, technology improves, new projects require improved machine repeatability and control, and capital budgets are tight. Easily access spare parts – As legacy control systems age it becomes difficult to find replacement parts. We utilize Allen-Bradley controllers, graphic terminals, and Bosch Rexroth HACD controllers for injection molding controls and clamp control. The specific series of product depends on your project scope but rest assured our engineers will select the best hardware at the lowest cost for your specific application. CompactLogix Control Systems: Safety, speed, and capacity built on a robust software platform while utilizing a single controller, is what we require for your plastic injection molding and machinery upgrade. 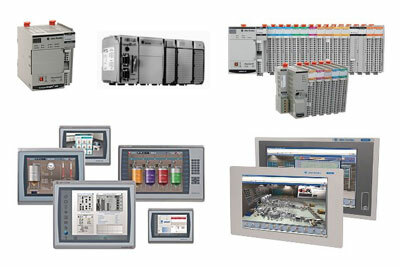 The CompactLogix series of controllers is our first choice to handle your machine functions because its integration between the programming software, controller and I/O modules reduces development time all while providing a cost-effective integration of a machine or safety application into a plant-wide control system. The Allen-Bradley CompactLogix series of controllers are ethernet ready and come in a variety of application memory sizes to match your current and future requirements. Bosch Rexroth VT HACD: This controller is best in class for both plastic injection molding and clamp control. The repeatability of the injection profile and the fast, but smooth, control of the clamp makes the Bosch Rexroth VT HACD-3 the premier choice. The standard configuration for this controller is up to five segments of injection control, up to five segments of pack control, and up to two segments of backpressure control. The Bosch Rexroth VT HACD-3 communicates via ethernet to the Allen-Bradley CompactLogix line of controllers. PanelView Plus 7 Graphic Terminals: Rugged graphic terminals or HMI (human machine interface) are the touch screens your technicians interact with each day. Powered by Windows CE 6.0, these Rockwell Automation PanelView Plus 7 Graphic Terminals are the window into your control systems. They allow you to see how your machine is performing while having the ability to adjust your recipes to get maximum productivity. These terminals include Ethernet connectivity, allow you to monitor applications from a remote location with VNC connectivity, use an SD card to copy and restore the operator interface, and include email and text notification capabilities. If you have questions about whether it’s time for a machine or control upgrade, get in touch. We’d be happy to talk about your operation, current equipment, and future goals. At 2R, our focus is to breathe new life into plastic injection molding machinery by upgrading the technology that controls the functions of the machine.